California has arguably taken stronger legislative steps to address climate change than any state in the union. Assembly Bill 32 mandates that the state reduce carbon dioxide emissions to 1990 levels by 2020. An executive order by Gov. Jerry Brown mandates an 80 percent reduction by 2050. California is also the first state to inaugurate a cap-and-trade program, which allows polluters to cancel out their emissions by buying carbon emission reductions somewhere else on a commodities exchange. A portion of those credits, or offsets, comes from carbon sequestration in forests. In Nov. 2013, California issued its first cap-and-trade credits under its so-called Forest Offset Protocol. Its stated purpose is to provide a financial incentive for landowners not to cut down trees. State-certified auditors measure the carbon in the forest, and this sum is verified by third-party verification companies such as SCS Global Services of Emeryville. The cap-and-trade program is fraught with problems, some of the most glaring of which are its provisions concerning forests. For example, cap and trade currently allows timber operators to generate carbon credits even when they clear-cut a forest, so long as the cut is no larger than forty acres. And it allows up to 40 percent of the forest to be made up of trees less than 20 years old. The program is also flawed at a more fundamental level in the view of yours truly, being that it is promotes commodification of a fundamental requirement of life: the air we breathe. AB 32 calls for “no net loss” of forests' carbon storage capacity through 2020, though the state's ability to determine whether it is meeting this goal remains underdeveloped. Air Board and Cal Fire staff are developing a system for tracking changes in forest carbon that is set to be unveiled in 2016. In an effort to understand the geographic distribution of forests the State of California has certified as part of its carbon sequestration program, I have reviewed the state's Climate Action Reserve database, which tracks the carbon offset projects. 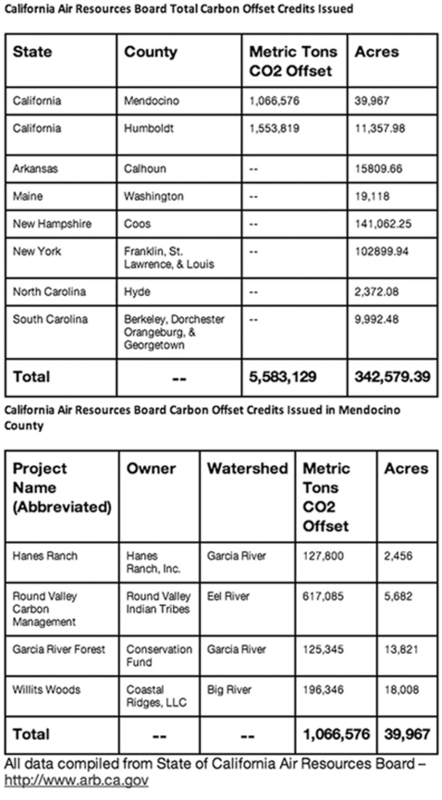 Remarkably, of the 14 forest carbon offset projects the Air Resources Board has certified, four are in Mendocino County and three are in Humboldt County. There are no other forest carbon offset projects in California other than in these two counties. The biggest carbon storage workhorse registered with the program, by far, is a Yurok Tribe project on 7,660 acres near the confluence of the Klamath and Trinity rivers, which accounts for roughly one-fifth of all carbon offset under the program so far. The Yurok project accounts for nearly one million metric tons of CO2 storage. A Round Valley Tribes carbon sequestration project (in Mendocino County) accounts for 617,085 metric tons. Since the cap-and-trade program as a whole involves 5,583,129 metric tons of CO2 stored in designated forestland, that means roughly 28.9 percent of CO2 storage under the cap-and-trade program is being provided by California's two largest Indian tribes. I had originally intended to publish part two of my in-depth study of Mendocino Redwood Company timber harvesting practices in this issue of the AVA. I am in the midst of thoroughly double-checking the data's accuracy, so I'm holding off on publishing my full findings until next week. lives in California's North Coast.